OK, this really is more "Road Food" and this is amazing and authentic. We were talking to a fellow RVer today and he was adamant about how good this place is. 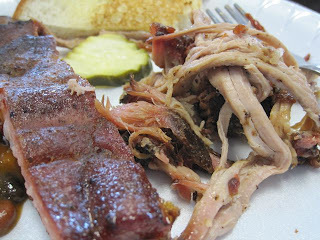 We know good barbecue and we were skeptical but decided to give it a try. 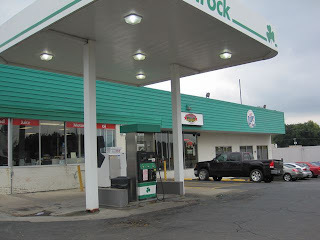 I don't think you get any more authentic calling this "road food" as it was in a GAS STATION!!!! This was the long line we encountered when we arrived. 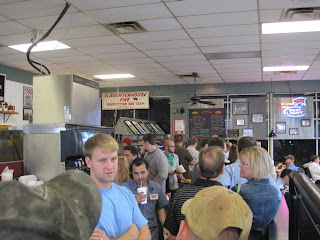 It moved pretty quickly and we decided to split a combo plate and order onion rings. One of the advantages of having to wait is that you get to see what others are ordering and salivate as they walk by with their food. Here is one reason this place is so popular. 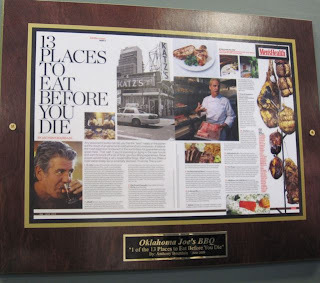 It was touted by Anthony Bourdain as one of the "13 places to eat before you die"! We had already split the plate before I remembered to take pictures. 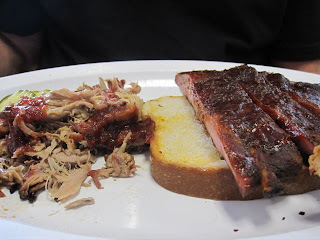 Ribs and pulled pork . 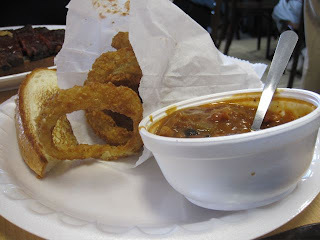 . .
Onion rings and beans . . . 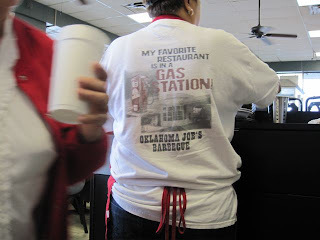 The t-shirt on the person cleaning tables! 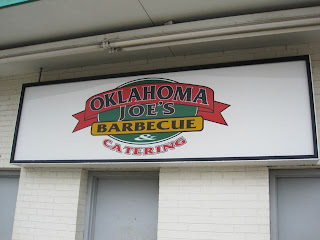 Oklahoma Joe's Barbecue, 3002 W. 47th Ave, Kansas City, KS 66103 - A MUST when you are in the area - trust us - we know barbecue! !